Remember the Eddie Vedder song “All the Way,” which Vedder penned about his beloved Chicago Cubs? Well, the Pearl Jam frontman, at long last, is making the song available on vinyl. Eddie Vedder’s “All the Way” will be released as an exclusive seven-inch vinyl record via Jack White’s Third Man Pressing. The vinyl will be available at a summer baseball game between the Cubs and the Cincinnati Reds, set for July 6 at Chicago’s Wrigley Field. Also included on the “All the Way” vinyl pressing is a version of the Chicago Cubs victory song “Go, Cubs, Go,” penned back in 1984 by folk musician Steve Goodman. For additional information, head to Pearl Jam’s official website at PearlJam.com. 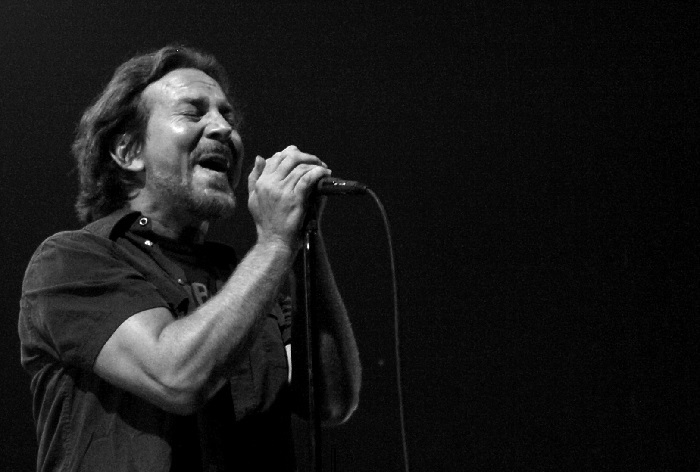 Vedder first released “All the Way” in 2008, and the song has the Pearl Jam frontman crooning that hopefully one day the Cubs will go “all the way” and winning the World Series. At that time, it seemed like an impossible dream, as the Cubs hadn’t won the World Series since 1908. The Chicago Cubs finally went “All the Way” And won the World Series in 2016. Vedder and the guys of Pearl Jam will head back to Wrigley Field this summer, as Pearl Jam has gigs lined up at the Chicago ballpark on Aug. 18 and 20. The special concerts are part of Pearl Jam’s upcoming North American stadium tour, which will kick off Aug. 8 in Seattle. Pearl Jam has also confirmed that they’re currently working on the band’s new studio album, but no release date has been announced. The band’s last album, “Lightning Bolt,” dropped back in 2013.